8/6/10 – Restitution claim – Douai, Musée de la Chartreuse – The Museum in Douai was destroyed in 1944 along with part of the holdings (many sculptures, ceramics, the ethnographic collection…). Before then, it had already undergone extensive looting in 1918 due to its location in the occupied war zone. Almost two hundred paintings vanished into thin air after being taken away by the Germans, despite the Hague convention, first to Valenciennes, then to Brussels where all trace was lost. 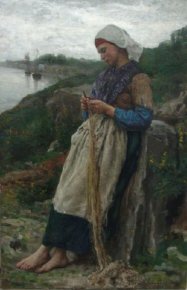 One of these paintings (ill.), A Fisherman’s Daughter by Jules Breton, resurfaced in 2000 on the art market, first at Sotheby’s then at Christie’s which both refused to sell it, knowing it came from the Douai museum. On 6 March 2000, Françoise Baligand, curator at the time, was informed by Sotheby’s New York that the painting would be on offer at the Köller Gallery in Zurich. After going there to study the canvas, she came to the same conclusion as the two British auction houses : this was indeed the Jules Breton painting from the Douai museum . Slight differences showed up when comparing it to an old photograph (notably the presence of a headdress instead of a cornet), due to a documented restoration dating from 1998. The work was finally sold and A Fisherman’s Daughter became the property of the Andersen Gallery in Beverly Hills in 2005 before going on display from 16 September to 31 October 2006 in an exhibition at the gallery highlighting 19th century French painting. Another restoration then returned the cornet. The eventful story of this Breton canvas continues to unfold though. The painting was scheduled for auction at Lempertz Cologne on 15 May 2010 (at an estimate of 120.000 to 140.000 €) but the city of Douai, which had tried in vain to recover the work, filed a complaint for possession of stolen goods on 14 May forcing the auction house to postpone the sale for at least a month. This is a particularly complicated situation. The canvas has belonged to various owners whose sincerity might be brought into question since Sotheby’s and Christie’s had both identified its provenance in 2000 and had refused to sell it. The work, as property of a French museum, is “inalienable” and indefeasible but Douai was indemnified after the war for its losses, notably the paintings which had disappeared. In a best case scenario, it is likely that the city will have to compensate the American gallery which today owns the painting if it wishes to exhibit the Jules Breton canvas again. The exact circumstances surrounding its disappearance were never determined : it might have been stolen in Douai before the looted works left, or in Valenciennes or even in Brussels.